Dana Tower Hotel. Situated on the very edge of the Great Rift Valley, Dana is considered Jordan’s largest nature reserve. Dana is on the major migratory routes between Asia, Europe, and Africa. Thus, it is the quintessence of flora and fauna species from all the three major continents. Intricate cliffs and canyons of sand, limestone, and granite strangely cut by the winds create a nearly moonlike landscape. Acacia trees twisted by drought appear among red and black cliffs, and sometimes even pink oleanders in blossom arise in the lower parts of the valleys. In one day, one can steeply descend from the eco-zone of the mountains with a Mediterranean climate (from 1600 meters altitude) to the sandy valleys of the Arabian plains in the Wadi Arabia desert (-100 meters below sea level). A winding road with tight bends abruptly descends from the King’s Highway and reaches the upper part of the Wadi Dana Valley. The last hairpin of the road leads toward the main street of the Dana village. During the Ottoman period, the Bedouins of the Al Ata’ata tribe built this village on the edge of the precipitous cliffs of Wadi Dana. As you walk down along the main cobble-stoned street, flanked by stone houses, you quickly reach the square where the village mosque is. After that, you continue down the narrow street that snakes gently among the houses. A bit further, there is an inflection point where the street turns slightly right toward the starting point of the Wadi Dana Trail. There, in the left side of a stone wall, a tiny arch marks the entrance to the Dana Tower Hotel. 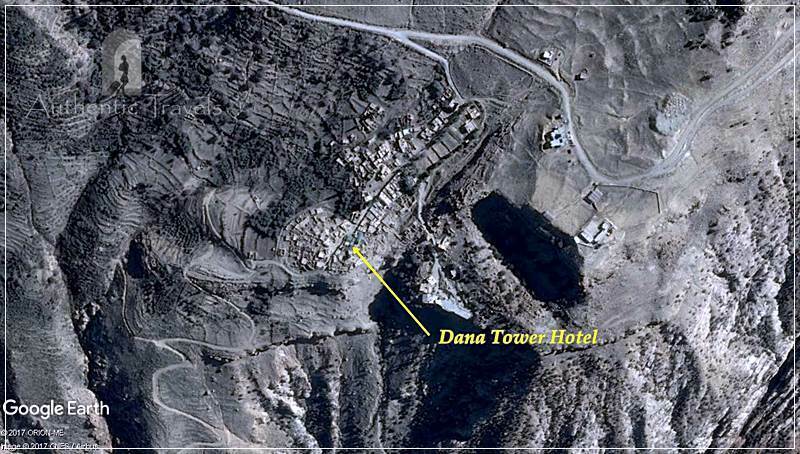 Dana Tower Hotel was the first hotel opened in the area when Dana became a nature reserve. When the new King’s Highway was built, many families from the village moved up to Al Qadissiya village, in search of better jobs, school, and housing. Nabil Nawafleh turned his family house into a small hotel, which he has been developing step by step, though. He rehabilitated old properties of his family, who owned about a third part of the village, or he bought new rooms from families who had abandoned their houses and left the village. The complex of Dana Tower Hotel has been gradually expanded. At this moment, it consists of several buildings disposed around the main house with guest rooms (the so-called ‘tower’ – from where the name of the hotel comes) and can accommodate nearly 70 tourists per night. The rooms for guests are grouped in several areas, and each area has a certain type of rooms: luxury family apartments (with private bathroom and even with kitchen or a small lounge), en-suite double rooms, and twin or single budget rooms for young people (with access to shared bathrooms). After you enter the stone arch, a cobblestoned alley goes to the back of the courtyard. There, on the left side, it is the entrance to the ‘Tower’ – the first house that was refurbished as a hotel. The ‘Tower’ takes its name from its parallelepipedic shape – a tall and compact volume, with three floors (higher than other houses from the village). A central staircase leads to the double and twin rooms from the upper floors, while there is a shared bathroom on each floor. Velvet and silky curtains adorn each room, and decorative furniture creates a refined and cozy atmosphere. Mosquito nets make you feel protected, and the baskets with flowers enhance the space with a bit of exoticism. Another group of rooms – the rooms with balconies overlooking the Wadi Dana, is located at the end of the cobbled alley that crosses the whole property. A metal staircase climbs on the rooftop of an old house with expansive views over the valley. A bed was placed on purpose on the terrace of the house and suggests that one might also spend the night under the open sky (the ‘1000-star and one-moon hotel‘). Two twin rooms have access to this large terrace, with shared bathrooms downstairs, though. Curtains with warm colors contrast the apparent stone of the walls and invoke a historic, meditative atmosphere. And if it’s too quiet, the birds of Dana Reserve have a sharp and cheerful chirp. There is an access to a small lobby with several rooms on the right side of the narrow alley that comes from the main street. On the other side of the alley, there are a few store rooms and a kitchen where no less than 12 Jordanian dishes are cooked for dinner (mansaf, magloobeh, khabseh, zarb, seanet coffeh etc). A night spent here means the opportunity to experience the delicious Jordanian cuisine. A bit further, a stair made of stone climbs steeply on the left of the cobbled alley. Upstairs, it reaches the common areas: the room for breakfast and dinner and two traditional guest rooms (majlis) – an open one (overlooking the reserve) and another one, entirely adorned with colored carpets on the walls and ceiling (with a terrace overlooking the village). The family apartments were refurbished in the nearby traditional houses. Bedouins built interior courtyards for each house in order to better lit the rooms or evacuate the smoke from the stove/oven. Nowadays, these courtyards illuminate the interior space of the rooms in a special way and withal create intimacy. Some of the walls don’t have finishes but only apparent stone, and this re-creates the atmosphere of the historic Ottoman houses. All apartments have private bathrooms, and some of them even have a small lounge with living-room furniture or a minimal kitchenette at the entrance. During my stay at Dana Tower Hotel, I chatted with Nabil in his office almost every day. He remembered the days when Dana was an active and lively village. In the evenings, one could see the local people sitting together, drinking tea, singing, and playing rababa (old Jordanian musical instrument) on the rooftop terraces of their houses. One could feel the smell of cooked food while walking throughout the village. One could hear the women working in their households and taking care of their children. Nowadays, only one family still lives in the village, but Nabil is optimistic. Jordanians come to Dana for a picnic or for drinking tea among the terraced orchards every weekend. Besides, the large number of cats, donkeys, and sheep grazing around the village create a lively and animated atmosphere. From the first moment I entered the stone arch at the Dana Tower Hotel, I felt an authentic Bedouin atmosphere. I admired traditional stone walls and black-white Bedouin tents. I sipped a cup of hot Bedouin tea all the time. I smelled the shisas with aromatic flavors. My favorite place was the upper terrace – arranged with low height sofas all around, covered with a Bedouin tent, and overlooking the historic village. There, I relaxed in the morning or in the afternoon. I breathed the air from Jordan. I listened to the sheep that grazed around the village and to the music of the Bedouins that were having a picnic nearby. There, I wrote in my travel journal. Wearing a traditional thoob, Nabil enhanced my experience in Dana village. Learning about Bedouins from a Bedouin is the core of this kind of experience. Moreover, drinking Bedouin tea with Nabil and Khabir at the fire observation center of the Dana Reserve was a simple, but unforgettable moment. Dana Tower Hotel can be found on booking, tripadvisor, or their personal website. Staying in this Hotel is truly one of a kind experienced. The road leading to this place must be very scenic and reading your blog post confirmed it. I really love how they came up with this idea, from the interior design to how stunning it is as a whole. The bed seem to be so comforting and I would love to let my body kissed the bed the whole night. Thank you so much for sharing this with us. As always, you have written the article flawlessly. Jordan is a place that I’m dying to explore, but I just haven’t made my way there yet. However, when I make it Dana Tower Hotel is a place I’d love to stay! I love those Bedouin carpets all over the ceiling! Plus, the grounds would make me feel like I was exploring an archaeological site. The majlis with Bedouin carpets is just so authentic. And the old Ottoman houses create such a unique atmosphere. When you go to Jordan, you will love it. I also like to stay in unique places. If you read the Lonely Planet book before going somewhere, you have a lot of chances to find awesome places. If it weren’t Nabil, this village would be abandoned already. Nabil was the first one that opened a hotel for tourists there, trying to animate the village again. I love staying in unique places like this it makes for a greater experience all around. I have not been to Jordon but it is definitely a place high up on my bucket list and when I go I would definitely consider staying here. I could easily sit on that upper terrace overlooking the old village for hours with a tea and taken in the world while I work on my computer. The upper terrace was my favorite: expansive views, comfortable, quiet.